A knee injury prevented striker Danny Hylton from travelling with the Luton squad to Bristol Rovers on Saturday, according to boss Mick Harford. The 30-year-old missed out from the starting line-up, as James Collins came in alongside Kazenga LuaLua, going on to score his 21st goal of the season during the 2-1 win. 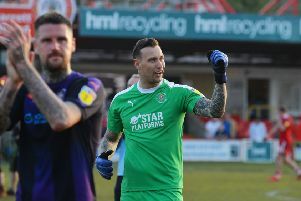 When quizzed as to the whereabouts of Hylton, Harford said: “Danny came off last week, he had some inflammation round his knee and he didn’t have full bend on it, so we left Danny at home. “Collo came back and got his goal but I thought the attacking in the first half was excellent. Both of Harford’s changes from the 4-0 win over Doncaster paid off handsomely, with Luke Berry in for the injured Dan Potts, scoring his second goal in as many games. The Town chief utilised all of his substitutes on this occasion too, with Harry Cornick, George Thorne and George Moncur all introduced late on as Town kept the hosts at bay. He added: “George is a holding midfielder, we thought he could go on there and give us a bit of maturity. "One of the reasons we put him on was because Harry Cornick was on and we thought with his passing ability, he might just release the pressure a little bit and get Harry over the top. "Everyone was good, I'm not going to name names, all the squad.